This really is a fun bag. Now that Reef is older, Oma likes to keep toys available to him when we have time to play. 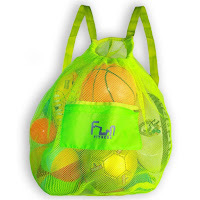 This large bag is perfect for our favorite kickball and several other toys. I like to keep my fun bag in the back of my car. The mesh design makes it easy to shake sand and dirt away from the toys before placing them in the car. The mesh is also great to allow any wet toys to dry to prevent mold or mildew. This backpack is very durable and secure. Oma loves the little extra pocket which is secured by zipper. Perfect for some cash and/or my ID. Although they call it a beach bag – I use it for everywhere! LIFETIME GUARANTEE: Full money back guarantee if you find your product does not function as listed here. Get FREE SHIPPING with orders over $35, so get one for you and 2 for your friends. “Oma Loves U!” has teamed up with Fun Fitness to conduct a giveaway for her blog readers. One lucky fan will win a Mesh Beach Bag (ARV $10). I like that it can hold 25 pounds! I like that it looks easy to carry and holds up to 25 pounds. I like that it is mess free and can hold heavy weights. What I like about it is that you can see through it and find things easily. What I like the most is that it is a mesh bag. Now I can carry all my water aerobics gear and they can dry out. I like that it is mesh, perfect for taking to the beach. I like that it has backpack straps. I like that I could put a lot in the bag..I am a active mom. I like that it can be used for a lot. I like that it can hold up to 25 pounds! That holds a lot! Thank you for the opportunity! I like the color plus the netting allows sand and dirt to fall out. I like that it can hold up to 25 pounds. I like that it's mesh and would allow toys to dry.